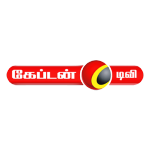 When the tamil television viewing community was looking for a totally different entertainment television channel , Captain TV, a standalone Television Channel was launched on 14.4.2010. A Complete Entertainment media, with emphasis on Social Awareness, Social renaissances, Propagating non-partisan news, Concentrating on upliftment of youth, updating Social and Current Affairs, promulgating the students on their future prospects, disseminating for the women empowerment, enlightening the social causes and effects and every view of the public. Captain TV mission is to become the leading Tamil Channel providing quality Entertainment through entertainment and infotainment channels.